Access Entertainment is pleased to announce that Sting, accompanied by the Korean Symphony Orchestra and conducted by Maestro Steven Mercurio (Pavarotti, Bocelli), will perform at the first SuperConcert of 2011, taking place on January 11 at 8pm at the Olympic Park's Gymnastic Gymnasium. This concert is part of Sting's celebrated world tour, Symphonicity, which finds him performing his greatest hits, re-imagined for symphonic arrangement. Selections, created especially for this tour, will include fan-favourites such as The Police hits "Every Little Thing She Does Is Magic", "Roxanne", "Next To You" and "Every Breath You Take," to notable songs from Sting's enduring solo career - "Englishman In New York," "Fragile," "Russians," "If I Ever Lose My Faith In You," "Fields Of Gold," and "Desert Rose." In addition to the Korean Symphony Orchestra, Sting will also be joined by a group of accomplished musicians comprised of Dominic Miller (Sting's longtime guitarist), Rhani Krija (Sting's longtime multi-genre percussionist), David Cossin (a multi-percussion specialist in new and experimental music and featured member of the Bang on a Can All-Stars), Jo Lawry (vocalist) and Ira Coleman (bassist). 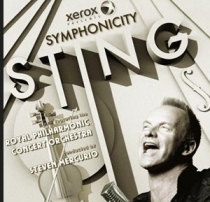 To accompany Sting's world tour, Deutsche Grammophon/CherryTree Records, recently announced a live CD/DVD package, Live in Berlin, featuring the Royal Philharmonic Concert Orchestra, conducted by Steven Mercurio, available internationally on November 26, 2010. This exclusive collection features previously unreleased material and many of his greatest hits, such as "Roxanne," "Every Little Thing She Does Is Magic," "King Of Pain," "Fields Of Gold," and more, all re-imagined for symphonic arrangement. Featuring special guest Branford Marsalis on select tracks, this live concert experience is quintessential Symphonicity. Deutsche Grammophon/CherryTree Records also released a companion studio album this summer, "Symphonicities", to critical acclaim. Highlights include fan-favourites culled from The Police songbook such as "Roxanne" and "Next To You," as well as songs from Sting's solo career including "Englishman In New York," "I Burn for You," "Why Should I Cry for You" and "She's Too Good For Me," among many others. Sting's first venture into the classical realm began with the success of his #1 album "Songs from the Labyrinth", a lute-based interpretation of the music of 16th century composer John Dowland, released in 2006 on Deutsche Grammophon. After completing the enormously successful Police reunion world tour, Sting returned to pursue his passion for combining musical genres with his most recent release "If On A Winter's Night..." which debuted at #1 on Billboard's classical chart. Prior to starting his solo career, Sting was the principal songwriter, lead singer and bassist of the rock band The Police. As a solo musician and member of The Police, Sting has sold nearly 100 million albums and received 16 Grammy Awards, two Brits, a Golden Globe, an Emmy, three Oscar nominations, Billboard Magazine's Century Award, and MusiCares 2004 Person of the Year. He is also a member of both the Rock and Roll Hall of Fame and the Songwriters Hall of Fame. Ticket prices for Sting's concert in South Korea are VIP Seats 230,000 Won, Floor R Seats 198,000 Won, R Seats 176,000 Won, S Seats 132,000 Won, A Seats 110,000 Won, and B Seats 77,000 Won. And if purchased with Hyundai Credit Card, there will be 20% discount (including VAT). The tickets will go on sale November 18 (Thrusday) 12 noon at Interpark.